This case study focuses on the transport needs of one of the nation’s largest hospitals, known for its pioneering approach to transparency and efficiency. By annually publishing comprehensive data on procedures, volumes, mortality, complications and innovations, this non-profit healthcare organization has taken a proactive role in improving the safety and efficiency of their facilities. After discovering a need for ergonomic transport solutions, the medical center has chosen to continually source its motorized equipment through Electro Kinetic Technologies since 2005. The medical center’s flagship campus spans over 6 million square feet, with over 35 buildings in total. In order to meet the maintenance needs of each building in the campus, maintenance and repair professionals must individually manage a set of assigned buildings. Some maintenance professionals are responsible for up to ten buildings at a time, and must transport heavy-laden tool and supply carts wherever they are needed. Depending on the employee and their individual work requirements, manually transporting these carts across the facility’s campus can expose maintenance professionals to musculoskeletal injuries, while lowering their productivity and morale. Some of this transport work also requires the cart to be driven both indoors and outdoors. Additionally, other hospital maintenance employees loading and unloading supplies off of truck beds and into storage can be exposed to similar musculoskeletal injury risk. The proposed ergonomic solution would need to be capable of handling loads up to 200-500 lbs, while versatile enough to meet the needs of both traveling maintenance staff and those loading and unloading supplies at the facility’s storage site. The solution designed by Electro Kinetic Technologies incorporated the hospital’s existing manual tool carts by fastening them on top of standard 1031 center wheel drive motorized platform carts. Each manual tool cart has its existing casters removed, and is mechanically bolted to the platform of a motorized platform cart. 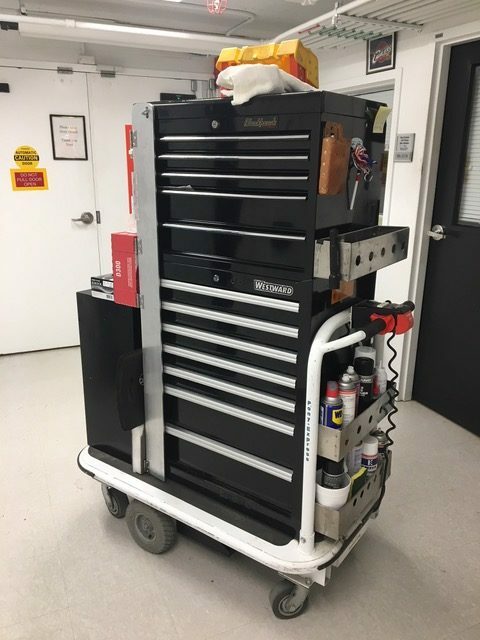 Once securely fastened, the newly motorized tool carts are capable of ergonomically and efficiently transporting the required loads across the medical center on both indoor and outdoor surfaces. This approach prevents the medical center from wasting functional manual carts, and avoids the need to replace or redesign existing shelving and tool storage on each retrofitted cart. Engineers at Electro Kinetic Technologies have repeatedly used this retrofitting strategy as a simple, yet effective means of motorizing existing equipment, and suggested it based on the application’s requirements and budget. Since 2005, the medical center has continued to order these retrofitted carts as needed. Hospital management reports that their continued orders are a result of the final product’s cost efficacy, ease of use, and reliability, in addition to the quality of service consistently provided by Electro Kinetic Technologies. Since the introduction of the retrofitted carts, the hospital’s maintenance department has seen continued improvement in workplace productivity, morale, and retention of experienced staff members, some of whom have worked at the facility for up to 40 years. These veteran employees in particular express a great appreciation for the carts. For additional information on custom or retrofitted solutions to your material handling challenges, contact us and a team member will help answer your questions.